Chameleons are primarily insectivores meaning they eat various insects. Some of the larger ones also feed on small reptiles and mammals and other species, like the veiled chameleon, will even eat plant matter. You should provide your pet with food daily even if he doesn’t eat it. Chameleons and other reptiles will often go through periods where they do not eat or eat very little. This is often due to changes in the weather and the season. If your pet looks healthy and is acting normally, there is usually nothing to worry about. Below are the foods and dietary supplements needed for a pet chameleon. By providing a well balanced diet you help ensure that your reptile lives a long and healthy life. Various insects will be the primary food of a chameleon. Crickets and mealworms are readily available at pet stores and online and are relatively inexpensive. Wax worms and superworms can also be used as treats or to add variety to your reptile’s diet. These insects tend to be more fatty and should not be fed to your pet in large quantities. 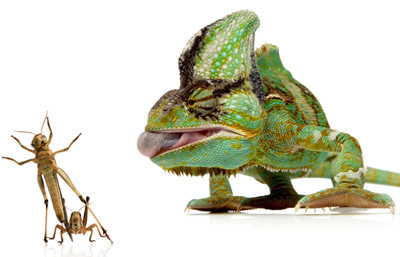 You should gut-load all insects that are fed to your chameleon. Gut-loading is feeding the insects nutritious food which will then be passed to your pet when the insects are eaten. There are a variety of commercial gut-loads available that supply the necessary nutrients. Mice can be added to a larger chameleon’s diet. Pinkie mice, newborn mice that have no fur and are pink in appearance, are a a good source of vitamins and nutrients. Pinkie mice should only be fed to your pet occasionally since they are high in fat. A pinkie once or twice a month can make a nice treat for your chameleon. Always try to use pre-killed mice as a humane way to feed your reptile. Frozen feeder mice are inexpensive, can be stored for a long time, and can be quickly thawed with warm water. Make sure the pinkie is completely thawed and at room temperature before feeding it to your chameleon. Some chameleons will regularly eat plant matter and others will eat it on occasion. If your pet likes to eat plants, try offering collard, mustard, turnip & dandelion greens, kale, and romaine lettuce. Be sure to chop the food into bite size pieces for easy consumption. Reptile supplements help ensure your pet gets all the nutrients he needs. Calcium with vitamin D3 and multivitamin supplements come in powder form and can easily be applied to food. A calcium with vitamin D3 supplement can be given about once or twice a week. A multivitamin can be given every week or two. You do not need to put a lot of supplement powder on the food, a light dusting is plenty. Too much of a good thing is just as bad as none at all. Chameleons prefer to drink drops of water and do not really use a water bowl. A water mister on a timer works well supplying your pet with water. You have to make sure the mist is aimed at leaves and other items where it can form droplets your pet can drink. A dripper is another alternative for supplying water. It is a water container with a valve and tube. A dripper slowly drips water onto leaves and other items where your chameleon can drink. If you want to hand water your pet, a spray bottle with fresh water will work. You can spray leaves and other items where your chameleon can drink the droplets.